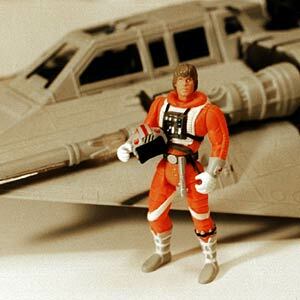 Kenner/Hasbro's first version of X-Wing Luke was really a Hoth Snowspeeder Luke. This custom reflects a more accurate version. I gave him a regular Luke head and painted the front of the gloves and the boot straps white, similar to Hoth Luke. The helmet is a modified cast of a POTF2 TIE Fighter Pilot head. I was surprised at how well the helmet came out when it was painted. I guess you can do just about anything with a small enough brush. My X-Wing Luke has the same helmet.